InTouch Weekly claims that Bruce Jenner is on 'suicide watch' having allegedly sunk into a deep depression as he prepares to go public with details about his gender transition. 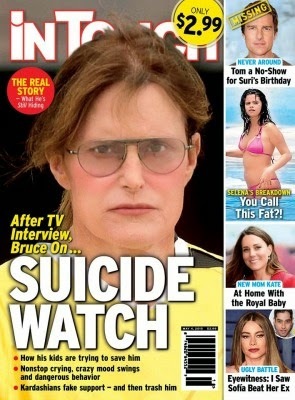 The mag alleges that Bruce feels abandoned and betrayed by his family "The whole experience is messing with his head. That’s something you didn’t see during the Diane Sawyer interview. No one talked about how they’re afraid he may harm himself. One minute he says he’s happier than ever, and the next minute, he’s sobbing that he’s ruined his life. It’s scary. Everyone is concerned about him, now more than ever. He’s a basket case. No one wants to say it, but suicide is on everyone’s mind.” the source said. Another Kardashian source has since rubbished these claims, saying the suicide story is rubbish!